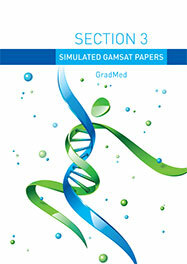 Learning the scientific content for the GAMSAT Exam is only part of the challenge. The other of course is learning the very specific application of this in the real exam setting. Since 2002 GradMed has developed an unrivaled bank of over 5000 simulated questions derived from direct experience of the examination. During the courses we make extensive use of these materials to ensure you can apply material in the problem solving context the exam demands. Our materials have been developed for the GAMSAT Exam only and are not derived from MCAT and other unrelated examinations. Students on the Full Preparation Course receive these 5000 questions in addition to many thousands of additional problems used as part of the teaching process. Our aim is ensure that you are familiar with every technique you may be presented with on the exam itself.